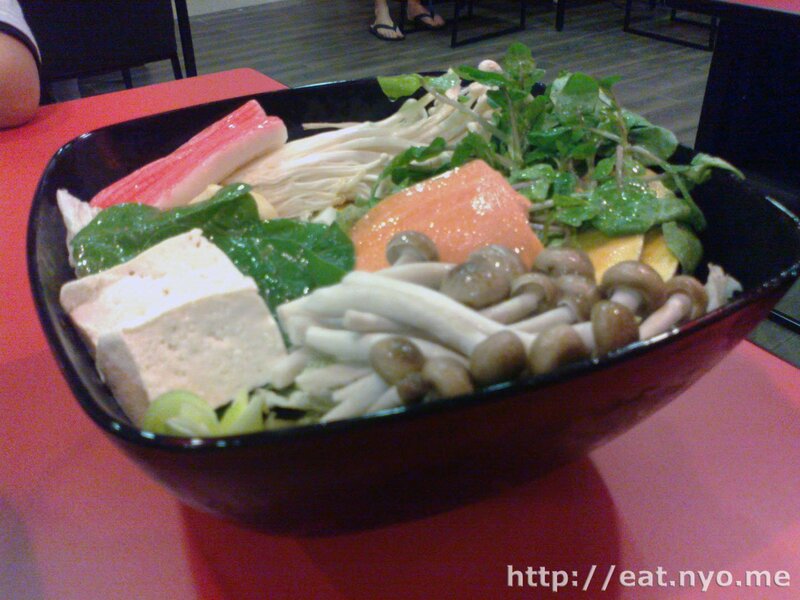 Beloved and I had dinner a few nights ago at Ganso-Shabuway. This place is located at Shangri-La Plaza’s new East Wing, which is just starting to get populated with commercial outlets. We used to have little reason to go here, but since Beloved started working nearby, expect more blogs on food places around the area. Anyway, I have honestly never heard of the place before, but their menu is simple: Japanese hot pot or shabu-shabu, hence the name. Although the prices were a bit steep, I somehow convinced my stingy Beloved to splurge a bit. 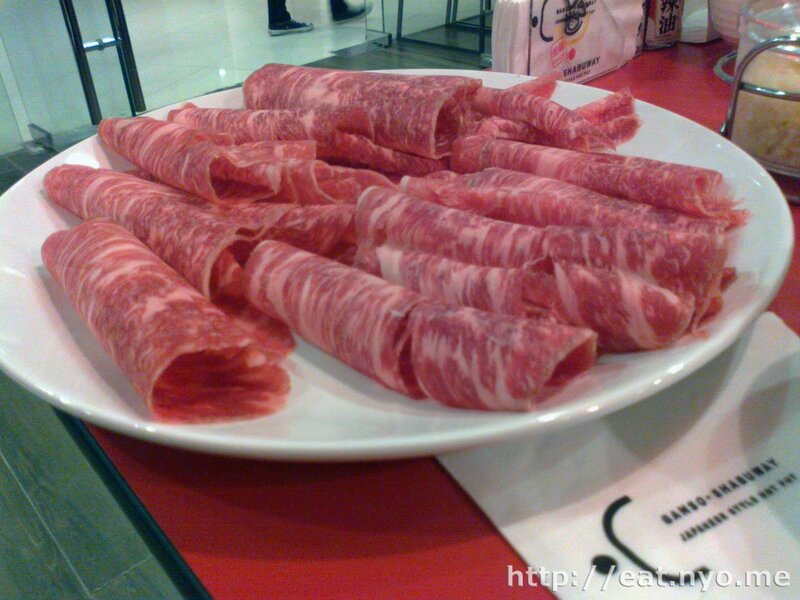 As I’ve mentioned, they have a pretty simple menu consisting of stuff you put in shabu-shabu. They’re all also conveniently placed into sets good for even-numbered people, instead of served up individually (although there are still individual selections). We ordered their Set B Menu set for Two (1095 Php), which has 250 grams of USDA Meyer Natural Angus Beef. Since it sounded a bit light, I urged that we get their Wagyu Beef Plate (200 grams for 825 Php). We were asked what broth to choose from traditional seaweed or spicy miso. Good thing you can order both, and we did so. 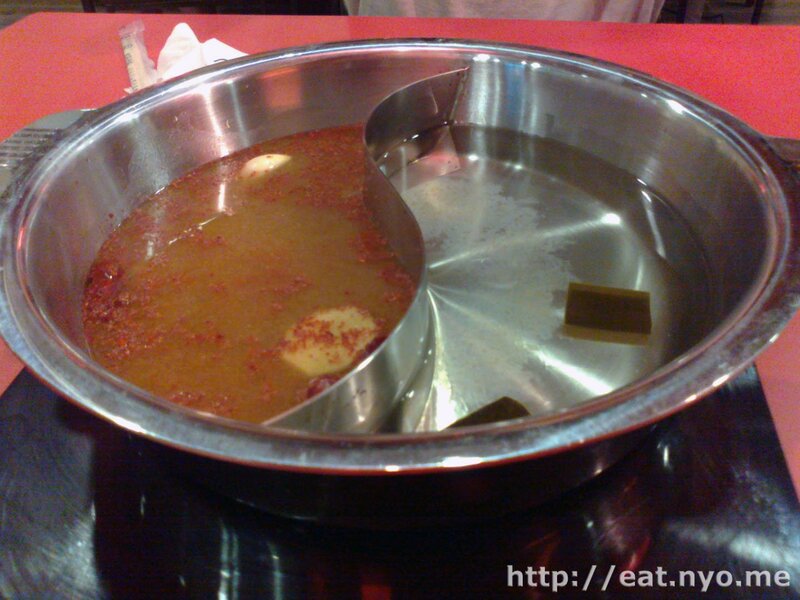 The broth was served in a metallic bowl divided appropriately in a yin-yang pattern. To the left is the hot and evil looking Spicy Miso and to the right is the pure and clear Traditional Seaweed. Beloved liked the left one over the right, which I preferred, but I did find out a few tricks during dinner, to be explained later. It had a head-start bowl as we were served stuff to be cooked in here. First, we were given a big bowl of veggies, and almost veggies—their Vegetable Deluxe Platter which is part of the set we ordered. I honestly have no concrete idea what some of the veggies exactly were, especially the greens that aren’t cabbage. However, I can identify pumpkin, enoki mushroom and another Japanese mushroom variety, and cabbage. There were also non-veggie stuff here, like kani or crabsticks and tofu. Our server recommended three minutes in the hotpot before consuming. Beloved couldn’t wait that long for the mushrooms in fear that I would consume more of them from her. Served next were the thinly-sliced USDA Meyer Natural Angus Beef. The server recommended 10 seconds cooking time on our choice of broth. With it, we were given a bowl of rice each and two kinds of sauces—a nutty sesame sauce and a tart and tangy ponzu sauce. Both Beloved and I agree that the latter sauce was better suited for the meal. However, the meat without sauce was wonderful in itself. Since it was sliced very thinly, it didn’t take long to cook through. And although the server recommended 10 second cooking time, I found that this one was best at around six to eight. When using the left, spicy miso broth, it was the dominating flavor. 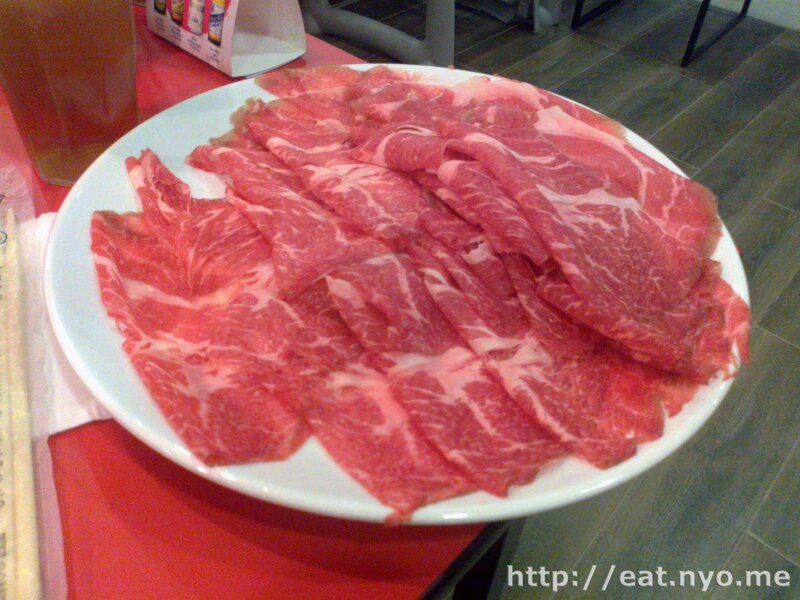 However, using the pure one, I could taste the savory and juicy meat served to us. Our extra order had a slightly pinker color and a noticeable increase in marbling. This is the prized Wagyu Beef Plate. Beloved liked the angus better, probably because it had a meatier taste and, she claims, softer finish after a few seconds. I would’ve agreed at first, but then I tried it raw, which was when I felt the signature “melts-in-your-mouth” sensation (I don’t recommend it though, because it’s not exactly fresh, and was a bit cold). I then experimented and found that dipping it in the miso broth for a couple of counts then to the clear broth for another two retains the wonderful sensation and giving it enough flavor to enjoy. I admit that I had fun with our meal. Finding out the perfect timings and amounts of sauce and broth that would go well with the meat was a wonderful learning experience. When we got our bill, I frowned a bit, tough. Plus service charge, we were billed more than 2.1K Php—certainly not a normal dinner night for the two of us. What’s worse is, despite the additional order and the large amount of veggies that came with it, I was still starving! Of course, a gourmet like me knows that you really do have to pay that much for imported delicacies, especially using such a way that’s probably not suited for local ingredients. Well, at least I won’t really dare eat local meat this way even if it’s sliced thinly and cooked in the broth for more than ten seconds. Note that I’m recommending this for the experience. Ganso-Shabuway is obviously a place not suited for frugality. Location: Shangri-La Plaza East Wing, 5th Floor. Not recommended for: Impoverished gluttons. Smart nomnomnom tip: Yes, it’s okay to have a bit of red.